TEDD Cute Crocodile/Dinosaur Zip Hoodie Long Sleeve Tops Sweatshirts for Your Boys. 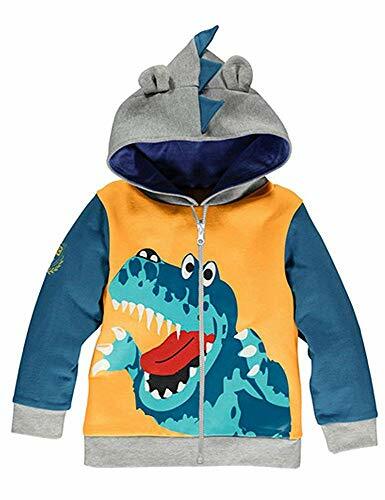 The children hoodie with the cute crocodile/dinosaur printed design will make your boy looks more cute and cool,and he will love it very much. This boy sweatshirt is made of fresh 100% cotton material,offers a delightfully cozy and warm feel in autumn/winter. Package Content: 1 x Boy Crocodile Hoodie. TEDD is a Professional Children's Clothing supply company,started in 2006,who has over 12 years expereince in kids clothings' manufacture and sale. Now we have about 150 workers besides our own designers and we know how to produce a fashion and comfortable clothing for your kids. We are deserved to be trusted! Thank you. We're so confident that you'll love this boy top that it's high quality and our best customer services. WE PROMISE THAT IF THE KID HOODIES HAVE ANY QUALITY PROBLEM,100% NO REASON TO RETURN!!! Customer satisfaction is our ultimate goal. Please feel free to let us know if you have any question. ✽ High Quality: This boys top is hardwearing, no pilling or fade, no deformation, no side effects on your child's delicate skin, and has excellent workmanship. ✽ Cute Animal Design: The boys zipped hoodie with the crocodile/dinosaur printed design will make your boy looks more cute and cool,and he will love it very much. ✽ Suitable Occasions: Perfect for being used as boys' casual wear, sportwear, sleepwear, home or outside wear in autumn, winter,spring,etc, ideal for boys' daily wear and best gift. ✽ Size Attention：Fit for age 1-7 years boys.We recommend that you choose a larger size to allow room for growing. ✽ 100% Satisfaction Guarantee: We promise that if the kid clothes have any quality problem,100% no reason to return.